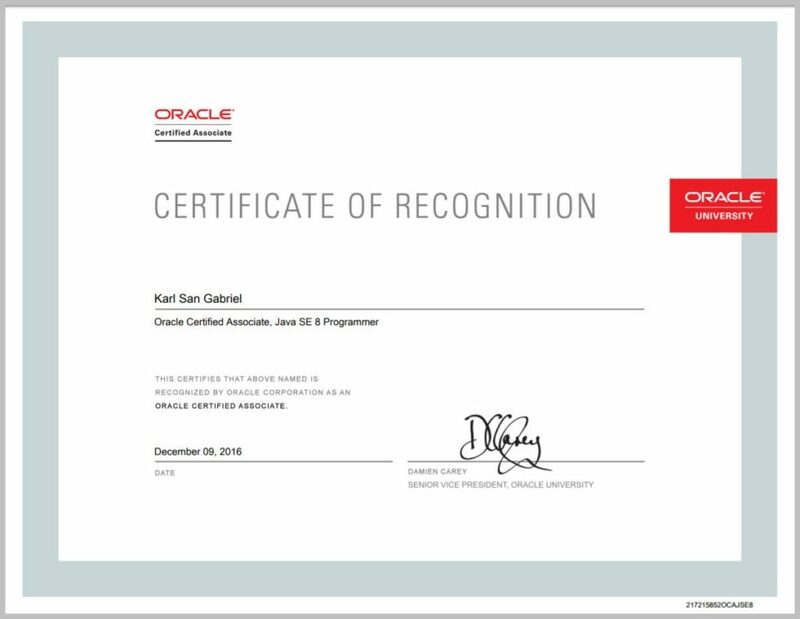 Are you targeting for Oracle Certified Associate, Java SE 8 Programmer certification? This post provides one of many ways to prepare for the Java SE 8 Programmer I Exam. I passed the exam! In December 2016, actually. The exam itself is relatively easy. Please note that I am an experienced Java programmer but who has SCJP 1.4 certification. If you are new to the Java programming language, you may need to invest more time and effort in studying some materials and really understanding the concepts. You may find the contents of this post not enough or too much to learn Java. In any case, they are a good start. This book is by Jeanne Boyarsky and Scott Selikoff. It a good enough reference for grasp the basics but not enough for a-little-more-advanced stuff. The exams are easy but, for me, not enough to pass the exam. I did not feel comfortable after reading the whole book (and took the quizzes). If you do not have little time to study because of work or school, switch to video tutorials. They are a time-saver! The only video tutorial I used is from Udemy.com. It is an 11-hour video that pretty much covers everything for the exam. It is probably the best video tutorial out there. I really felt confident after completing it. I bought a mock exam from Whizlabs.com. The questions are tougher than those from Boyarsky/Selikoff’s book. You would notice that too.